Make the biggest day of your life spectacular! 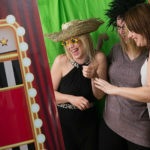 Booths4you are always excited to be part of any bride and groom’s wedding day, playing a small part in bringing fun to the proceedings with our photo booths or adding a bit of glam to the venue decoration. From start to finish we promise a first-class service filled with communication to put your mind at ease throughout the process, then on your wedding day we swing into action, working around your and the venue’s timings to make sure everything is in place and ready to go as planned. Fun, laughter and happy memories. 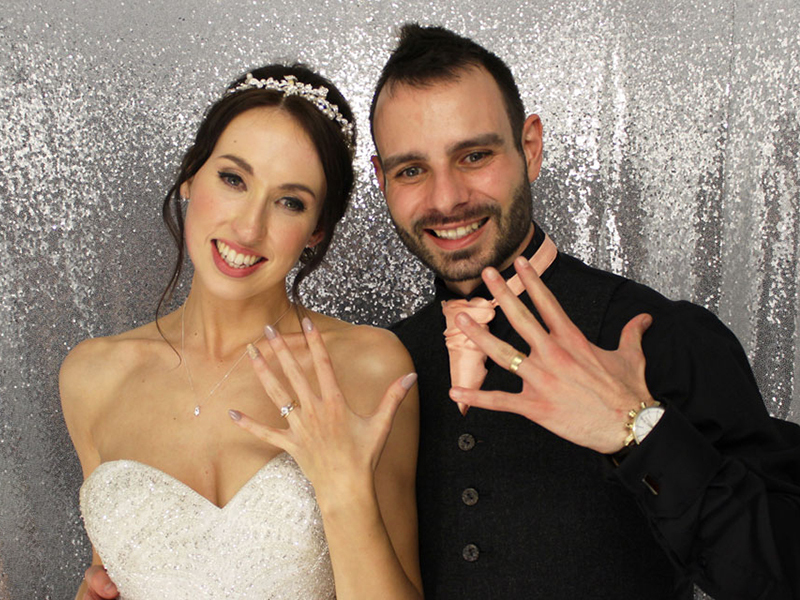 With loads of features, our wedding photo booths are sure to capture magic moments from your wedding day. And it’s not all about photos! Your guests can also leave a short video message or why don’t we set up Marryoke? We can design a template to match your theme and add a custom message. 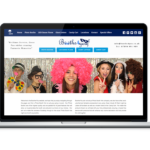 We also have a great choice of photo booth skins to choose from, or why not get one customised – a bespoke design of your choice which you can keep as a memento. 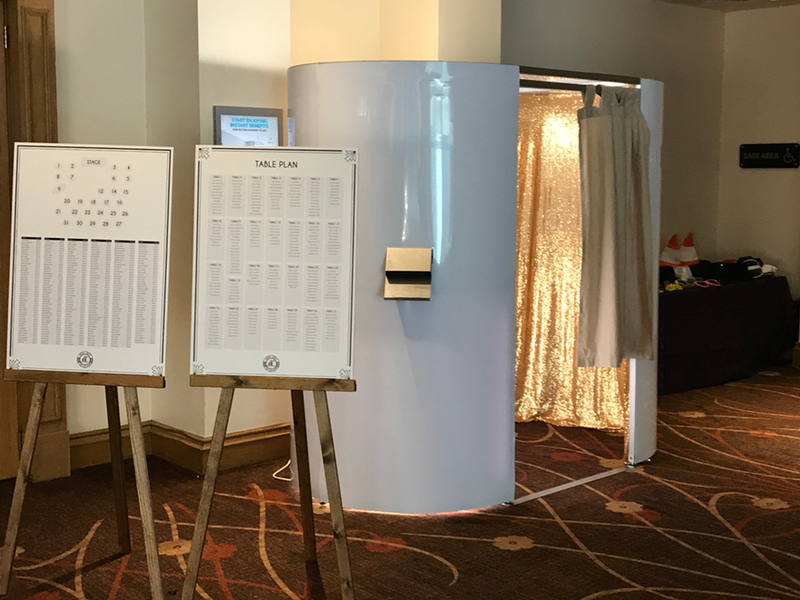 With loads of features, our booths are sure to capture magic moments from your special day. And it’s not all about photos! Your guests can also leave a short video message or why don’t we set up Marryoke? "Flawless from start to finish. Excellent company to deal with. Brian, thank you very much." "So fantastic and so much fun! Great communication from start to finish with the company, had many of our guests asking for their details. Can't recommend enough, not to mention the price is great! But on the day of your function it's the confidence they provide for a fun night. Can’t wait to see you at our next party whenever that may be." The perfect way to make a statement and add the WOW factor! 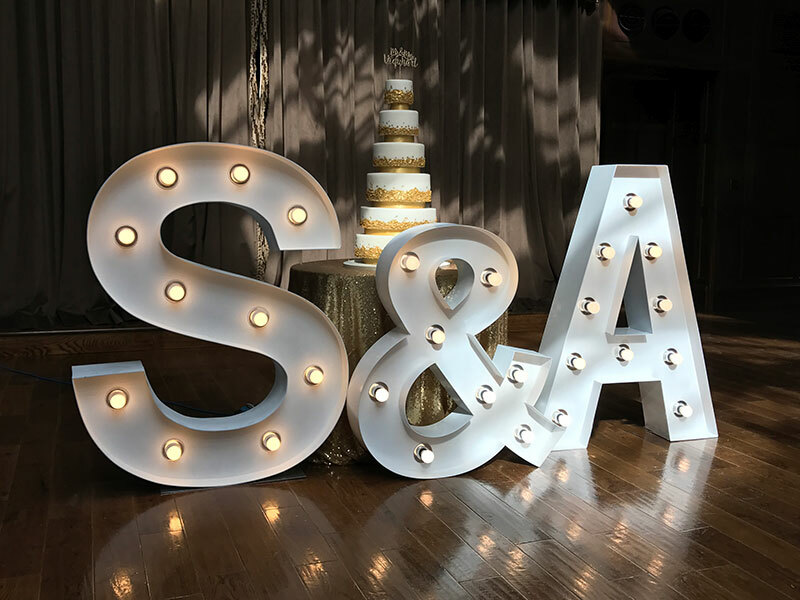 With the full alphabet in 4ft giant light-up letters plus love hearts and ampersands we can create any name or word… ‘Love’ or ‘Mr & Mrs’ or why not let us create your new married name? Or what about ‘I Do’, ‘Dance’ or ‘Party’? Our letters are fun and create a fantastic photo opportunity. We can even change the colour of the bulbs to match your theme or the mood lighting for the room. Make your 1st dance even more memorable with the twinkling lights of our white or black LED dance floor, we promise that the lights will shine long into the small hours. With their gloss finish, our floors look absolutely fabulous and complement any room. 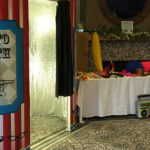 We will build it around your timings so we can come in before it all starts or in the changeover hour to put it in place, then with the flick of a switch the dance floor is ready for the night’s festivities. 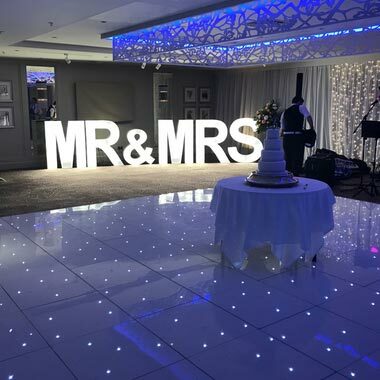 We can even use the LED dance floor to create a wedding aisle – 4ft wide and up to 30ft long, creating a spectacular base for the most important steps of your life. Create the venue of your dreams! It’s your special day, you deserve to have the venue of your dreams! Let Booths4you decorate the room with a colour scheme or theme of your choosing, no need to be limited by the choice your venue may have. 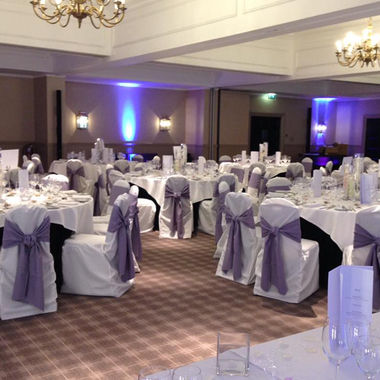 Options include a fantastic range of crisp white or black linens, chair ties, table overlays and runners and the all important table centre pieces. Or why not let us add the finishing touches with mood lighting and a starlit curtain to create an amazing ambiance – the magnolia walls will be awash with colour. A hassle-free service from one trusted supplier for all the big and small things, that has to be a big tick on the “to do” list. 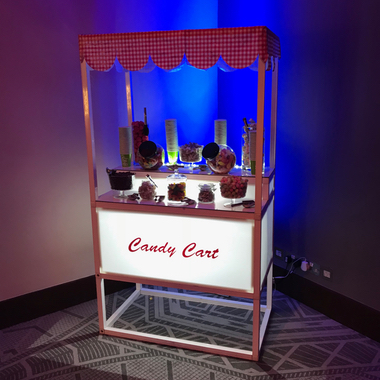 Our candy carts are a perfect addition to any occasion. A modern twist on the usual wooden cart, ours are a stylish mix of clean lines and great internal lighting, helping them to enhance any rooms decoration. Choose from a great range of quality sweets, if your favourites not on there, tell us and we will make sure we find it! The hire is for the full day, so just let us know when you want it from and we will deliver the cart, get it all set up, stock it with sweets, scoops, pincers and bags and leave it for you to enjoy. Then we come back at the end of the night and take it away – what’s more, you keep any sweets not eaten on the night!